Blitzing around a car park has never been so much fun. I consider myself a fairly rounded motorcyclist. 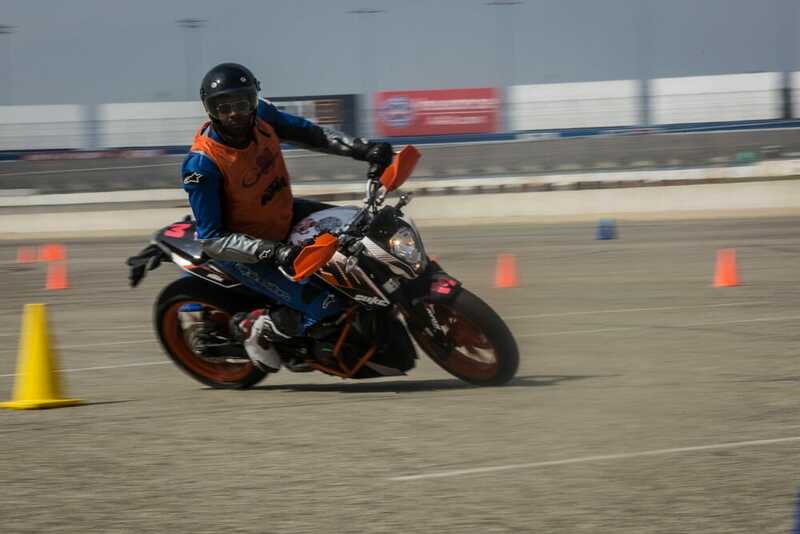 I’ve participated in most of the sports that involve two wheels at one time or another, but there is one aspect of bike sport that’s entirely new to me – Gymkhana. This style of riding, massive in places like Japan, has yet to take off in the States but if James Bush, owner of Moto Gymkhana has his way, this could be about to change. James is hell bent on making Gymkhana a viable motorcycle sport in the U.S. and his passion for this most obscure of biking pastimes is clearly evident. So what exactly is Gymkhana? How do you do it? Basically, this form of riding can take place anywhere you have a car park, making it one of the most accessible sports that require two wheels. Riders have to weave their way around a circuit marked by a series of cones with different meanings (full circle, right turn, left turn, slalom, etc.). It can be confusing, especially when you do a full size course, but like any form of bike sport, once you’ve got the course down and it comes down to a battle between you and your buddies, the competitive instincts come filtering through. However, more than that, the benefits for any rider, but especially new riders, is absolutely clear. Gymkhana is slow speed action, requiring light inputs in order to stay smooth and keep the chassis from tying itself in knots. A rough riding style is punishable by a terrible lap time. Smoothness is the name of the game – the sport forces riders to create good control habits in order to be smooth and fast, something new riders will soak up like sponges. 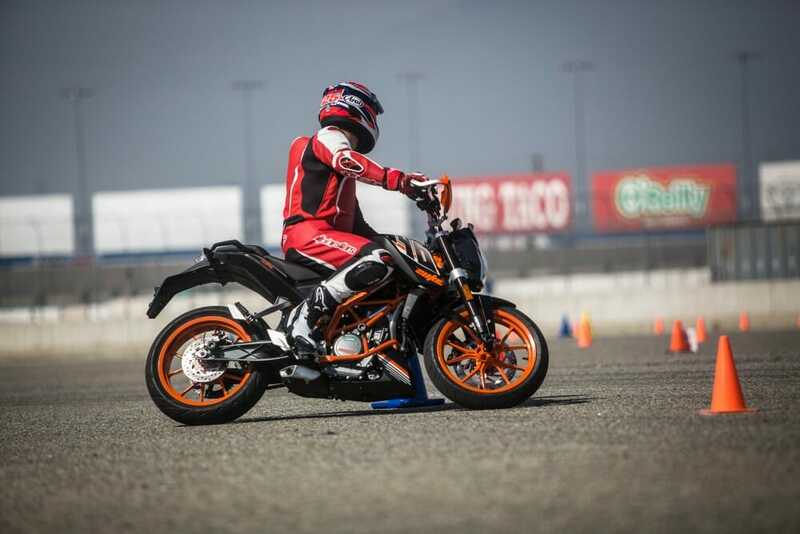 KTM USA’s Chris Fillmore admitted a supermoto riding style doesn’t work with gymkhana, but got the hang of it anyway (as he always does). He’s not lying. Gymkhana is one of those sports that once you’ve got a handle on it, the risks of injury are extremely low. That means you can push the limits further and further, braking deeper, accelerating harder than you did last time. Watching James in action, it doesn’t look like he’s doing anything terribly difficult, but it’s not so much the speed at which he’s going you notice, more the fact he has an acute idea of where he’s actually going. Let me explain. We were riding in the Auto Club Speedway car park at Fontana in Southern California, and as such the course, shall we say, was on the large side. I was doing double duty that day, testing parts for our Pikes Peak KTM 1290 Super Duke R, and didn’t get to spend quite the amount of time I’d have liked getting to know the course. As such, I didn’t once figure out where I was going and had to follow James every time I went out. I mentioned to James a way to cut down learning time would be to number the cones, so you basically join the numbers up and you can’t really go wrong. That may be the case, but for now I was stuck behind the master, which really wasn’t a bad thing because there was no way I was going to ride faster than him! This is the man oping to break the American gymkhana scene – James Bush. What he mentioned before about Gymkhana involving many different forms of motorcycle sport rang absolutely true, and there are little skills I picked up each time I ventured onto the course on the KTM 390 Duke that I’ve noticed I’m now using on the road, like better modulation of the front and rear brake to keep the chassis in a happier place come corner time. You can slip and slide all you like, backing it in and having fun, but it really hurts your lap times if you do. KTM USA hero Chris Fillmore was out there with me and he mentioned to being a little baffled that a sliding supermoto style simply doesn’t work with this style of riding. You must keep the wheels in line, keeping the bike neutral and ready for that next burst or acceleration. 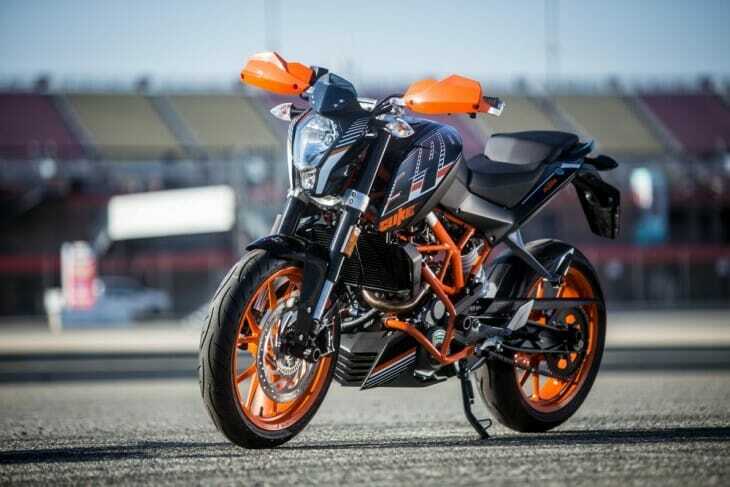 Moto Gymkhana has teamed up with KTM USA and now has a fleet of 390 Dukes for riders to try out. I truly hope this form of riding takes off in the States because as more and more riding areas get shut down across the country, we need to find new ones. This makes Gymkhana perfectly suited to high density city living, because all you need to set up a course is a car park and a set of cones. However, more than anything, I think the real potential winners of Gymkhana in the U.S will be riders who have just got their license. These riders, like young kids, have yet to form the bad habits that are so hard to break as you get more and more seat time and this form of riding will put them in great stead for safer riding practices in the future. 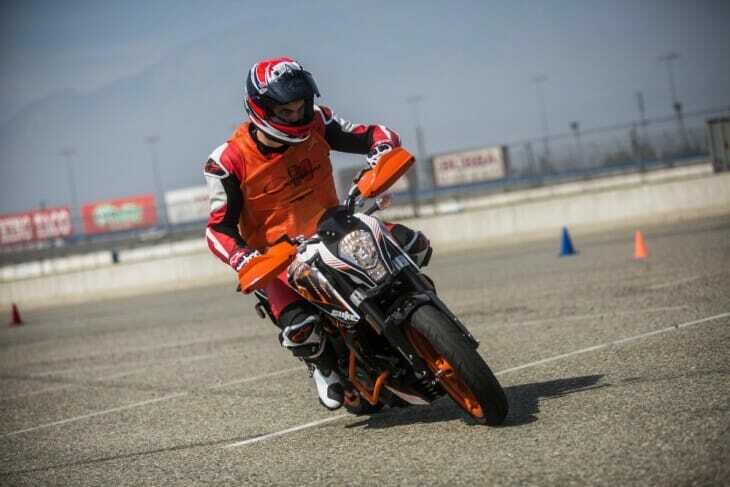 KTM USA is now putting their weight behind the Moto Gymkhana program and James Bush is busing hard to get this form of riding off the ground, touring the country with a bunch of 390 Dukes and a few hundred cones. If you’d like to learn more about this style of riding, head over to http://m-gymkhana.com. In the meantime, have a look at some of the Japanese YouTube videos below to get your appetite whetted.